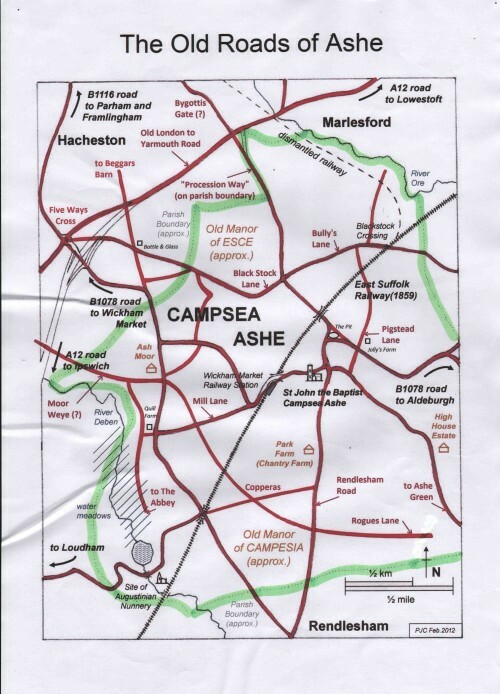 In his History of Campsea Ashe (about 1914) the Rev Lucas defined the boundary of the village as described below. On the map following his description (originally drawn by Peter Carter) the boundary is marked in green. "The area of the Parish is 1813 Acres, 1 Rod, 11 Pole of which about 13 Acres are water. If we wished to beat the bounds of the Parish, we might start from the boundary post by the side of the Wickham Market road, about 300 yards beyond the Ashe Corner and proceed across the fields in a north easterly direction to a post on the roadside, about 230 yards west of 'Brickfield Cottages'. thence north east to a post by the side of the Marlesford road; thence along the road to Ivy Farm, (now the occupation of John Cracknell); - the farm is not in this Parish; the boundary line turns east when opposite Ivy Farm, crosses the railway line and goes round to the south west corner of Blackstock Covert and to the Blaxhall road, (where there is another post), thence south through Beedon's Whins; south east to the other Blaxhall road (where post); through Long Grove wood to near west end of the Avenue; thence across a field to a post on the Tunstall road; thence south across to near Potash Cottages (in Tunstall Parish); thence west to (& including), the Cottage (Mrs Newson's) on the edge of Rendlesham Park. From there by circuitous route north and west through the West Belt, by the side of the Ashe Green road, to the Rendlesham Park Lodges (which are in the Parish); along Rouge's Lane to the Eyke road (post); across to south east end of Copperas Wood, to post on the road; thence to the further branch of the River Deben; then along the river and partly across the marshes - to the post - from which we started."